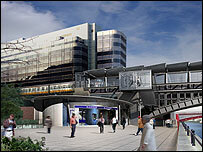 Work is due to begin on the long-delayed £5.5bn modernisation of the Thameslink rail project for London. Luton Airport Parkway is the first of 23 stations scheduled to have their platforms lengthened by 2011. Peak-time trains will increase from eight an hour to as many as 24, using 12-carriage services instead of eight. Services on the busy north-south line through central London will continue to run during the work, expected to be completed by 2015. Andrew Mitchell, of Network Rail, said the project would deliver significant improvements to the service. He said: "Today is the start of a long-sought after scheme which will deliver what passengers need; more seats, less crowding, more direct services and better connections in London." There will be major improvements to London Bridge, Farringdon and Blackfriars stations, which will become the first station to span the Thames. The £5.5bn project includes £3.5bn worth of infrastructure work. The rest of the funds will cover expenses such as new rolling stock.